NEW 4 BR, 3 Baths, 2 MBR Suites Waterfront 31541 Coastal Club Resort Beach House in Lewes DE Sleeps 10, 4,200 sq ft! When you vacation here at Coastal Club Resort in Lewes, DE, you will experience the adventure of a lifetime. The Clubhouse is your hub for recreation and socialization, with a state-of-the-art fitness center; an outdoor pool with swim up bar and a water playground for the kids. You’ll also love strolling along the 3 miles of wooded walking trails. 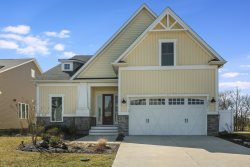 Incredible new vacation home at Coastal Club in Lewes Delaware. This new home features 4 bedrooms, 3.5 baths, 2 master bedroom suites (one downstairs and one upstairs), dramatic 2 story family room, a gourmet kitchen and the best resort amenities in the area. This is a Schell Brothers home - King Fisher model! Coastal Club is a new resort in Lewes, Delaware that offers a wonderful vacation get-away from the everyday. CLUBHOUSE and RECREATIONAL PASSES: The pools open Memorial Day weekend to Labor Day weekend. The Clubhouse opens mid June '17 and is open year round. Passes to utilize the pool and clubhouse amenities if you are 12 years are older are quoted at $40 per person for a weekly pass or $12 per person for a single day pass. Children under 12 don't need a pass - they just need to be with an adult who has a pass. LINENS: We provide mattress covers, pillows, blankets and comforters. Our rental guests can either bring along their own sheets, pillow cases and towels or rent them locally. One place that rents linens locally is Sheets at the Beach located just a couple of miles from the home. You can order in advance and pick up at their store or have them delivered to your home for an additional fee. https://www.sheetsatthebeach.com . Imagine living in a community so rich with amenities that you never want to leave! Located just moments from downtown Lewes, Coastal Club is an extraordinary resort destination, situated around a spacious nature preserve with a peaceful pond, bordered by rolling woods.